i have been making this salad for years. i truly love it. very light and refreshing and perfect for summer-time BBQ’ing. takes just a few minutes. 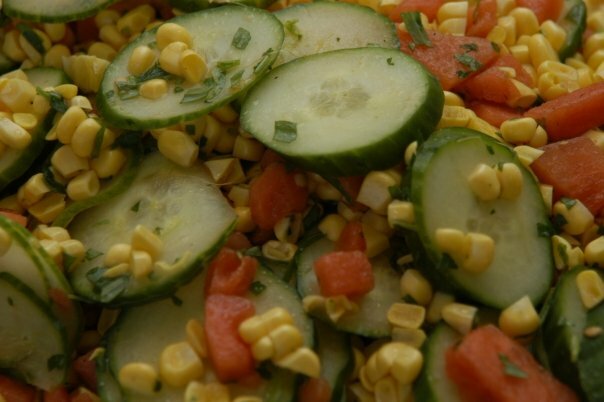 cut kernels off of a 4 ears of corn, dice watermelon (about 1 cup), and slice cucumber into thin slices(1 english cucumber) … finely chop one bunch of fresh tarragon. keep leftover dressing in fridge, great for salads, as a marinade for chicken or fish, or just drizzle on top of grilled chicken. Would you like to vote for my blog?